This month marks 300 years since composer George Frideric Handel premiered his composition (and one of the most famous pieces of classical music in the world) Water Music – and it was in a rather fitting setting. playing outdoors (and carrying across water) – took place at about 8pm on 17th July, 1717, aboard a City of London barge in the River Thames. Some 50 musicians played the piece – using everything from flutes and recorders to trumpets, horns, violins and basses – with Handel himself fulfilling the role of conductor. The barge was part of a rather grand flotilla which made its way up the river from the Palace of Whitehall to Chelsea, at the centre of which was a royal barge upon which King George I and members of the nobility, including various duchesses, rode. 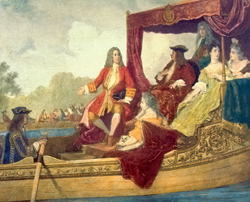 Numerous other Londoners also turned out to hear the performance aboard all manner of watercraft and the king was apparently so impressed with what he heard that he requested several encores both on the trip to Chelsea and on the return journey. The story goes that the somewhat unpopular king had apparently requested the concert on the river to upstage his son, the Prince of Wales (and future King George II), who was stealing the limelight by throwing lavish parties (the king and his son were famously at odds and it was therefore no shock when the prince didn’t attend the performance). There’s another story, meanwhile, that suggested Handel composed the piece to regain the favour of the King which he had apparently lost when, seeking to capitalise on his growing fame, he left his employment as conductor at the court of the then Elector of Hanover (a position George held before he was king) and moved from Germany to London during the reign of Queen Anne (although some claim the future king knew he would one day follow Handel to London and actually approved of his decision to move there). Water Music, meanwhile, has since become part of popular culture – it’s generally said that most people will recognise at least one part of it – but interestingly, no-one is said to be exactly sure how the music, which is generally broken into three separate suites, should be performed, given that the original score has been lost.